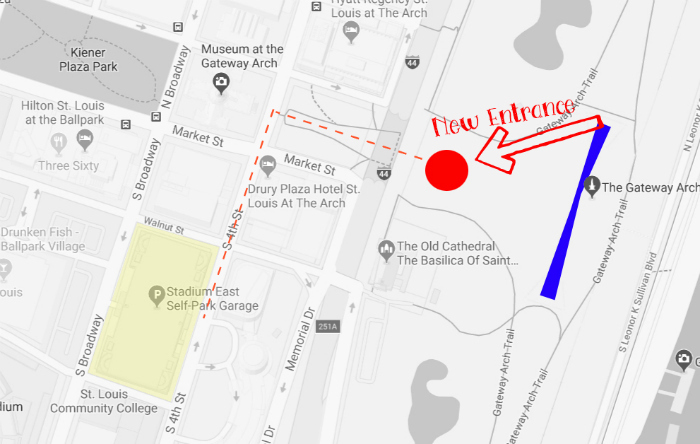 What You Need to Know about the New Gateway Arch Entrance and Museum! 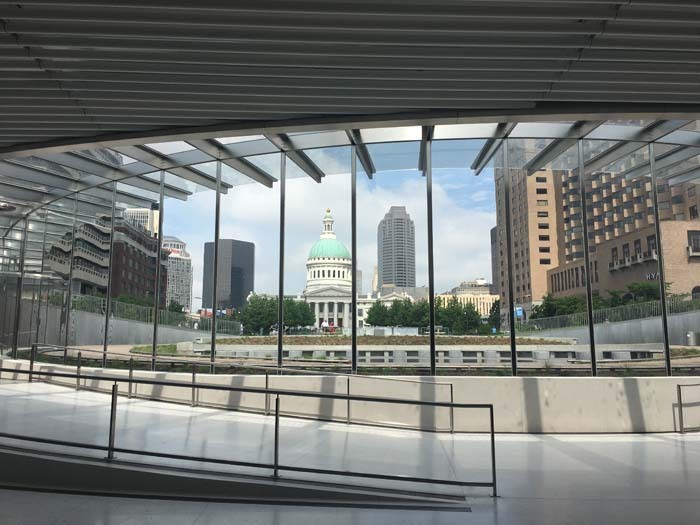 Home » What You Need to Know about the New Gateway Arch Entrance and Museum! The wait is finally over! After five long years, construction workers have packed up their gear. The massive overhaul of the Gateway Arch entrance, grounds and museum IS DONE! Whooo-hoo! 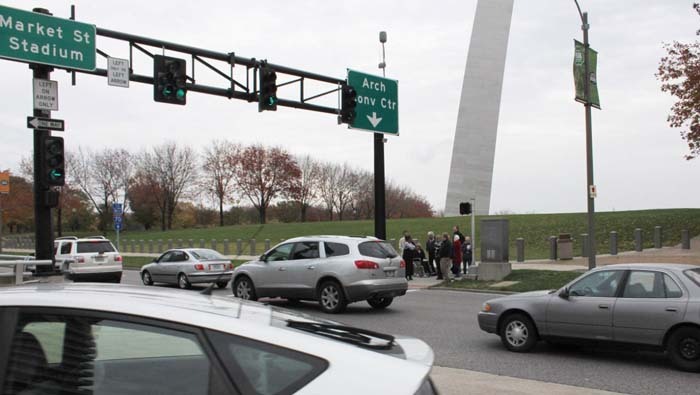 Remember watching confused tourists try to walk to the Arch from downtown? Well now its easy! Thanks to the CityArchRiver project, St. Louis’ front yard is a spectacular play space. I was lucky enough to attend a media sneak peek, so now I can tell you what to expect next time you visit the Gateway Arch. 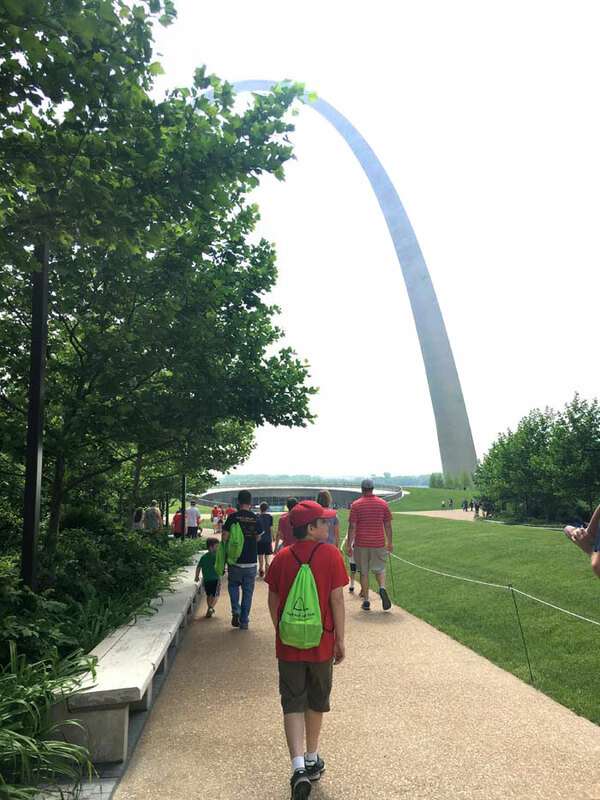 Oh, and here’s a link to the FREE Gateway Arch Park app! It will tell you when the Arch is open, help you find parking, get your tickets and more. The biggest change to the Arch is the entrance. They moved it. The Arch now has a big hobbit hole entrance on the west side of the park grounds, facing the Old Courthouse. The old north and south entrances at the legs of the Arch are now exit only. So if you want to take a picture while standing up against the stainless steel legs of the Arch, save it for the end of your visit. 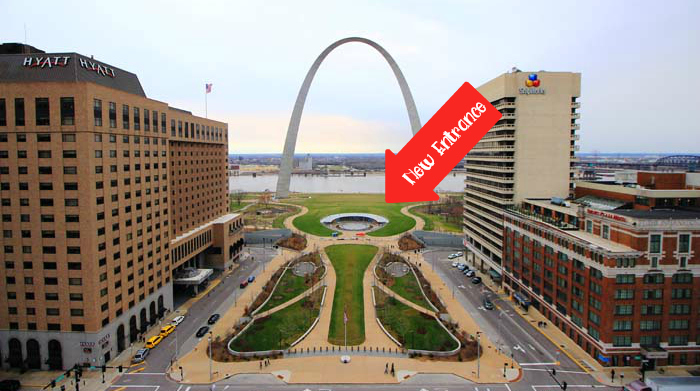 The other major change happened in 2015 when they demolished the Arch grounds parking lot and turned it into a grassy park area. Now don’t panic! I measured this out on Google Maps–the distance from the old garage to the north entrance is the same as the distance from the East Stadium Garage to the new west entrance. 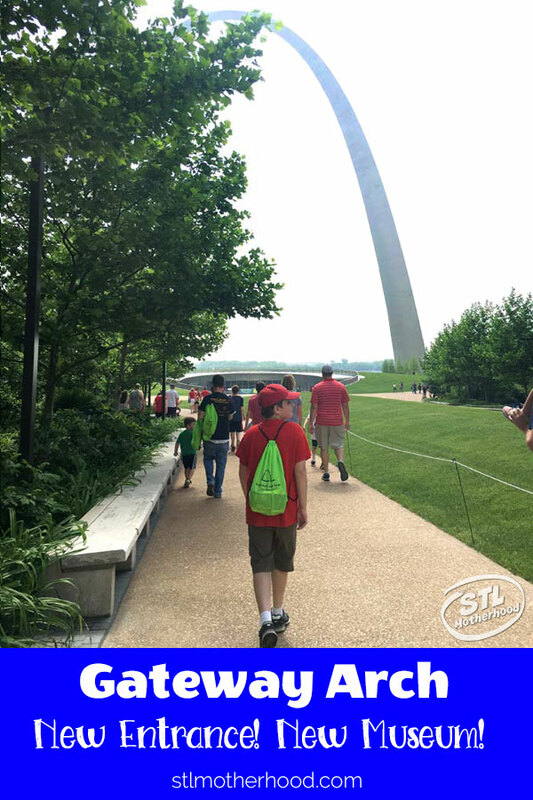 The Gateway Arch Park Foundation did a survey and found an average of 2600 empty parking spaces within a 5 minute walk to the Arch on an average day. Now that figure gets thrown out the window when the Cardinals are playing a home game, so my Number One advice to NOT visit the Arch on game days. Unless you’re going to the game too, then you’re cool. 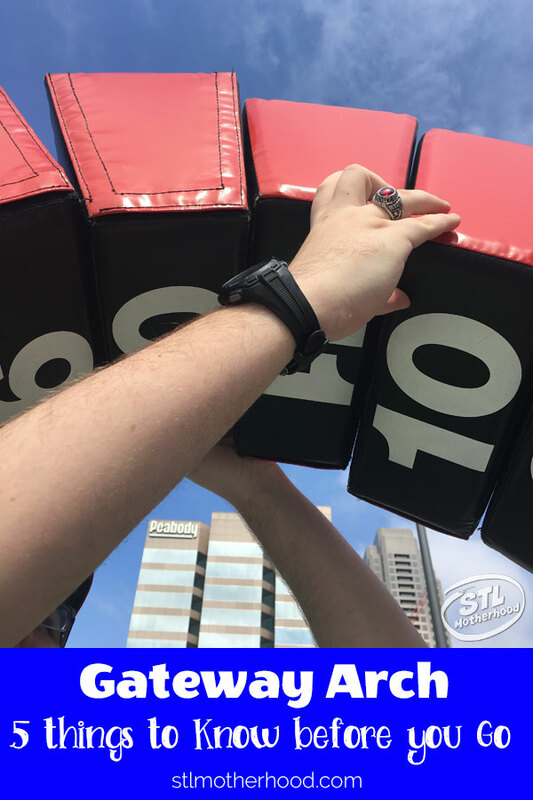 Nearby parking is gobbled up by Cardinal fans, and the garages raise their rates on game day. The new redesign also makes getting to the Gateway Arch entrance wheelchair and stroller friendly. There are literally no steps between the East parking garage and the Arch! Seriously. They put curb cuts on all the sidewalks leading from downtown parking to the Arch, plus there are ramps leading down to the new entrance and inside the new museum and lobby. There’s even a loading zone on Market Street (near the KMOV building) so you can drop off visitors who want to shorten their walk. Sadly, they couldn’t make the tram ride to the top handicap accessible. We’re kinda stuck with the system as it was designed in the 1960’s. But they added a replica of the Arch’s “keystone” to the lobby area. So if you’re visiting with a guest who can’t make the tram ride, or you’re feeling a little dicey about riding up in the cars, or you just want to see what you’re getting into…you can get a virtual experience right on ground level. 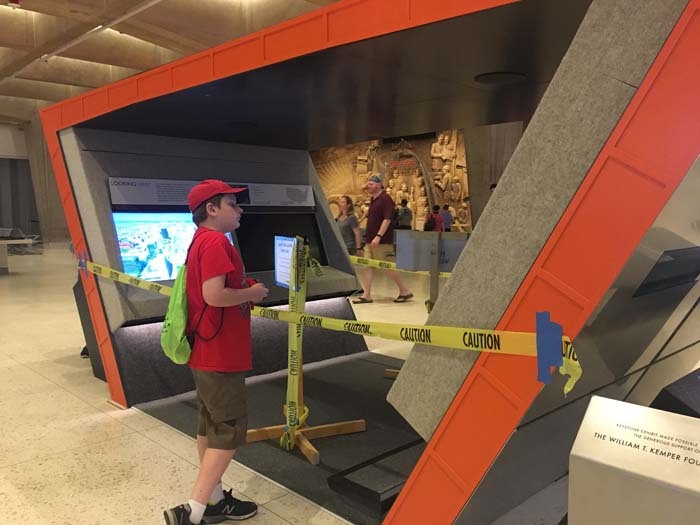 Mitch and I visited a few weeks before the museum was complete, so the display still had caution tape on it. But when you visit, you can walk right in! It’s a pretty good replica that replaces the windows with monitors showing a recording from the actual windows 630 feet up. The window glass is from the actual Arch (they have to be replaced from time to time) and the light on top is the original light from the ’60s! Adding a proper lobby is one of the best things the remodel gave us! Besides being stunningly beautiful, the new lobby is big enough to hold a good number of visitors INDOORS before you enter security. Yes, we still need to go through an airport style security zone (it’s a federal monument after all) but now you can wait in comfort. There’s also a restroom you can visit before standing in line–great news for families! You’ll buy your tram tickets and movie tickets in the lobby. You’ll also have a chance to buy Riverboat Cruise tickets here if you like. Of course, you can also buy your tickets online! Tickets are timed, so plan accordingly. The Arch now has “peak pricing.” That means you can save money if you visit during slow times of the year. Obviously this is going to be easier for locals, since we can arrange to visit on a weekday in the spring…but if you’re planning a summer visit you’ll miss out on the discount pricing. Here’s a sample pricing chart for May 2019, right at the start of summer vacation. 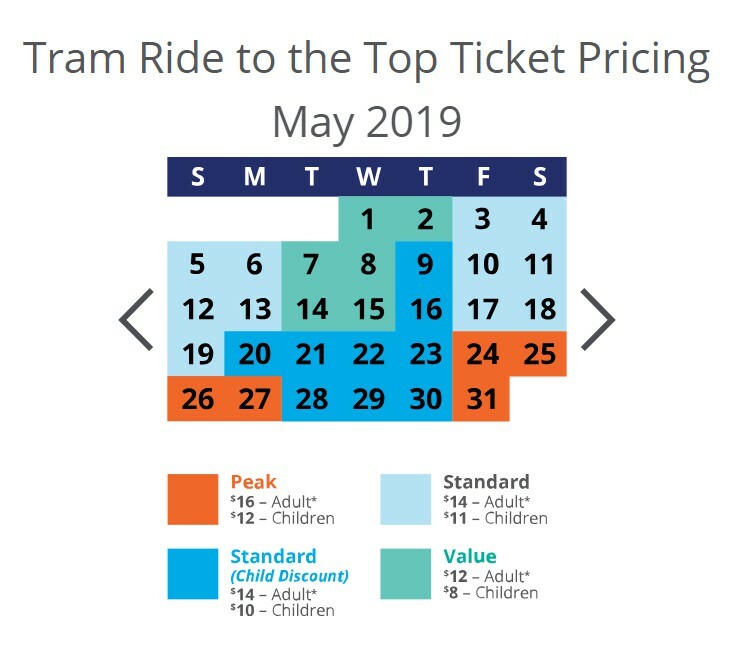 You can see a month like May has both “value” pricing days, days with kid discounts and the more expensive peak pricing. The new museum is really exciting for families! It’s still telling the history of St. Louis and an updated story about America’s Westward Expansion. But now every single display has something kids can touch and play with to add to their learning. 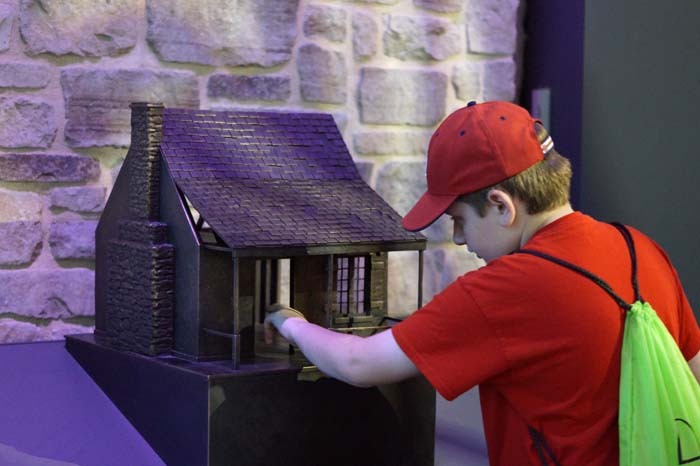 Psst: The Arch museum is one of SEVEN family-friendly “children’s” museums in St. Louis. What to know what the other six are? Click here! Constructed as authentically as possible (without modern machinery) by the National Park Service’s Historic Preservation Training Center, based out of Frederick, Md. Featured in the “Colonial St. Louis” exhibit gallery. 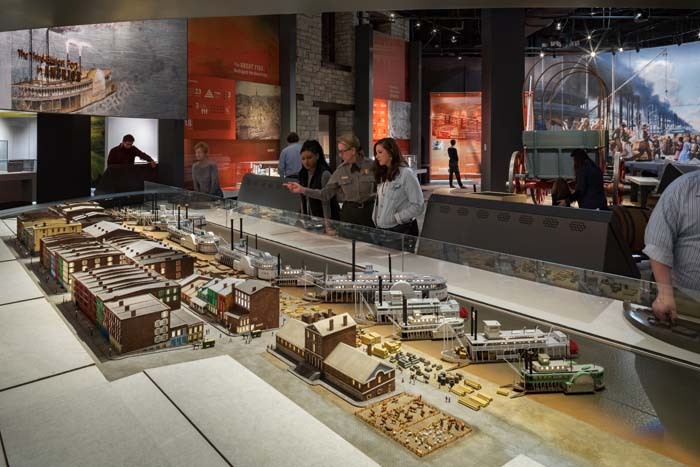 5-block scale model of what the downtown St. Louis Mississippi riverfront looked like in 1852 with a diorama depicting buildings, people, livestock, cargo and steamboats. The model shows how busy the riverfront was during that time. Featured in the “Riverfront Era” exhibit gallery. Replica of the historic riverfront building that was demolished for the construction of the Arch. Features stones from the original building that were saved during demolition.